The Jersey Shore may have suffered a few major blows in the past, including 2012's devastating Hurricane Sandy and a not-so-glamorous portrayal on the eponymous MTV series. However, the seaside town of Asbury Park has truly revitalized itself in recent years, rising from the ashes of the storm (and its own tumultuous history) so successfully, it was named one of the Top 10 Vacation Destinations in the U.S. in 2017. 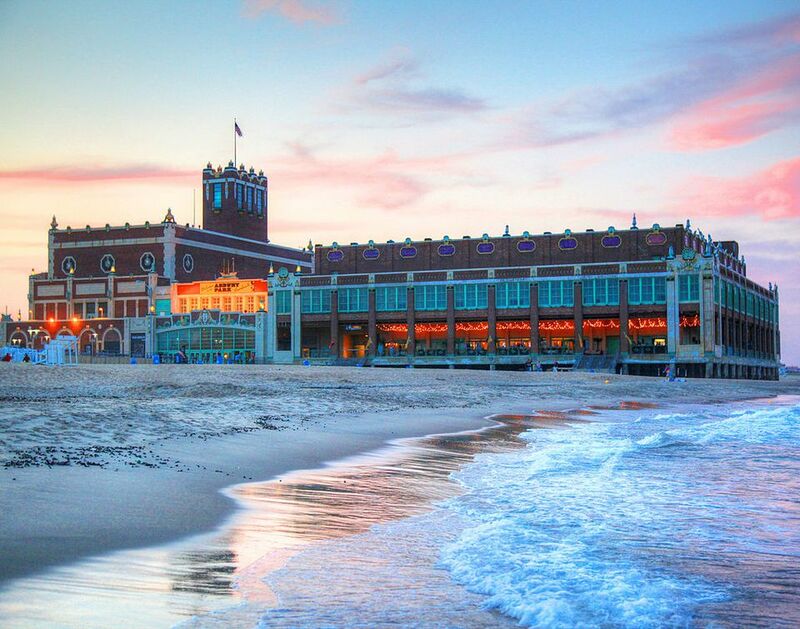 Whether you want to catch some rays in the sand or follow the footsteps of your favorite rock stars, here's what to do in Asbury Park. It’s not a true trip to a Jersey beach town without a walk on the boardwalk, and the newly refurbished Asbury Park Boardwalk is one of the “Big Jersey Six”, the state’s most prominent seaside promenades. Unlike the more famous boardwalks, there are no piers or rides, and few food stands or shops, but it still offers incredible views of the Atlantic Ocean. Whether you choose to see a show on the boardwalk at Convention Hall, or one of the kitschy local institutions like Wonder Bar, you can’t go wrong with any the shows within Asbury Park’s bustling music scene. However, an absolute must-see on your trip is The Stone Pony, a legendary concert venue that has served as a launching pad for some of New Jersey’s greatest musical legends including, of course, Bruce Springsteen, as well as Patti Scialfa and Jon Bon Jovi. Rainy days at the beach are always a bummer, but not to worry, Asbury Park’s lone movie theater, The Showroom, screens both summer blockbuster hits as well as lesser-known indie films and a few cult classics. Grab an umbrella and ride out of the storm with their popular dinner-and-a-movie series on Wednesday nights. You'll receive one ticket for the movie of your choice and as well as two tacos or one entree and a non-alcoholic beverage from MOGO Korean Fusion Tacos. If the weather is in your favor, catch a drive-in style movie at the Baronet on the rooftop of the Asbury Hotel. The rooftop oasis gets its name from the long-shuttered Baronet Theater, which now houses the hotel. Classic films like Jaws and fan favorites including La La Land are shown nightly at sundown during the summer season, and on the weekends until the end of September. Beer, wine, and popcorn are available for purchase. Experience a little slice of Americana at the Silverball Pinball Arcade Museum. Located directly on the boardwalk, the living museum features boardwalk classics like pinball, skee-ball, air hockey, and more modern video games. There are over 600 active games on the floor of this arcade, so you will never run out of great gaming options. Reminiscent of Coney Island’s Funny Face, “Tillie” is the nickname of a slightly creepy grinning figure that was originally created sometime in the 1950s. The two Tillies were twin murals painted on the side of a building that formerly housed Palace Amusements. Tillie served as an homage to George C. Tilyou, the former owner of Steeplechase Park in Coney Island where similar smiling faces became popular around the same time. Local residents have a soft side for Tillie, and after rumors spread that Tillie might suffer an unavoidable fate, they rallied together and formed the Save Tillie website. Whether you’ve traveled from near or far, you’ve come to the Jersey Shore to see the ocean, so do not miss the white sandy beaches that make this area so famous. Whether you choose to swim, lay out in the sun, or enjoy a wonderful night under the stars, there is something for everyone. Beach passes are required of all guests during the summer season during the day, however, the weekly bonfires are open to the public, free of charge. Fourth Union is a skate park located in the Carousel building right on the Asbury Park Boardwalk. Catering to the town’s large skating community, the indoor park features a skateboard bowl with obstacles, features revolving art exhibitions as well as a retail store, and a variety of rotating food trucks. This endeavor is the brainchild of Madison Marquette, the firm responsible for Asbury Park’s Hurricane Sandy restoration, along with Red Bull. The park is just one facet of the ever-evolving businesses and amenities to come at the Asbury Park Boardwalk.